Portable, damage-free, suction cup hooks–I’ll take five, thank you. Confession: Every once in a while, I have a forehead-slapping moment where I, one who has blogged family travel for a decade now, realize another simple family travel hack I can’t believe I didn’t think of years ago. This is one of those. Years ago –> I picked up a couple of clear plastic suction cup hooks just like these to use at home–one for each of my daughters’ wash cloths so we could hang them to dry in between uses over the bath tub. They are very easy to put up–just get the suction cup wet, hold to the wall, and “clamp down” by moving the hook down into place. Yet every time we traveled somewhere that bathing suits were needed, I would feel mounting frustration when the hotel, resort, cruise ship, or vacation rental did not provide a suitable place to hang wet bathing suits. And of course there would be wet bathing suits–in our case, eventually five at a time. And hanging them over the shower curtain rod or from towel bars just puts the dripping water where you don’t want it. As I recently cleaned out our bathroom closet, I came across these plastic hooks and thought, there must be some very useful application for these–don’t send them off to charity just yet. SHAZAAM. Within 24 hours, I found myself with a wet bathing suit in my hands, squeezing all the water out that I could, and trying to dangle it just so from the shower nozzle so that it would drip-dry without slipping off onto the shower floor. Of course, mine wasn’t the only swim suit to consider. And that’s when the visions of clear plastic suction cups danced in my head–“Why aren’t these in our travel kit? !” I shrieked at the shower wall. Suffice to say, next time they will be. Want to add them to your family’s travel kit, too? Looks like Amazon has a package of six in three different sizes at about 50% off (thanks for your click-through!). For more clever products and gadgets to ease your family’s travels, browse all Pack This! 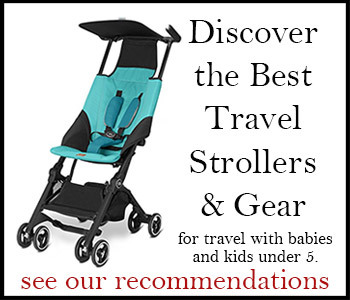 recommendations and see the best in baby travel gear recommendations including lightweight travel strollers, convertible car seats, travel beds, and more. Have you subscribed to Travels with Baby Tips? More tips and advice are on the way! For help for planning travel with a baby–or toddler or preschooler, order or download your copy of the award-winning Travels with Baby: The Ultimate Guide for Planning Travel with Your Baby, Toddler, and Preschooler. Have you seen the latest features at our sister site, Family Travel 411? Curious about this content? See my editorial content disclosure.